I See Sam is a terrific reading program for beginners through grade 3. Much to my delight, Wendy showed great progress while using the readers. 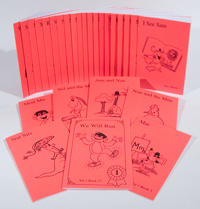 At its most basic, I See Sam is a series of readers that span eight levels with corresponding flash cards. Each level works on different decoding skills, and each successive levels builds on the previous one. The readers themselves are very easy to use. There is no real teacher preparation, which is always a bonus. The only teacher preparation is in actually learning to use the program, which is simple to do. Each book contains sections for Sound and Word Practice, and this is the place where your child practices before actually trying to read the whole story. This practice makes it easier for your child to succeed at reading. This is where you will introduce new sounds, new combinations, and new words, phonetic and sight. 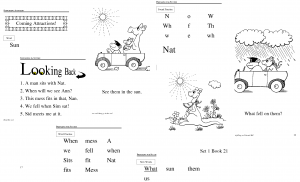 The instructor guidelines offer a complete process for introducing the new sounds and words, and for correcting mistakes to help guide your child. Once your child has mastered the sound and word practice sections, it is suggested that you have your child read through the story two times, which will promote fluency, comprehension, and bolster confidence. If your child makes two or more mistakes while reading the second time through, she should read the book one more time. Remember, mastery of each section is important before moving on. While reading the stories, you will be reminded to praise your child’s efforts often. You will also be prompted to ask questions to assess comprehension and retention. Each level comes with a progress chart – your child gains a star (or flower, or seashell, or …) for each book that is mastered. At the end of each book, there is a “Coming Attractions” section that exposes the child to those new concepts that will be introduced in the next story, another way to help ensure your child’s success with reading. Assessment is built into the program. Every fifth or sixth book has a “Looking Back” section at the end which is used to ensure that your child is making progress and remembering previous lessons. I used the “Looking Back” sections to place Wendy in the program since she already had some reading experience. It worked wonderfully – we just went through the books until she didn’t meet the criteria listed on the “Looking Back” section for mastery of the previous four books. If your child doesn’t meet the criteria for mastery of the “Looking Back” section, simply move back to the previous four books and start again from there. That’s the program in a nutshell – not hard to figure out – not hard to use. The books themselves appeal to all ages – Wendy and Will both wanted to read them. Also, all the books contain simple black and white images, which the kids enjoyed coloring once they had mastered the book. For more information, including videos and guidance, please visit the Academic Success for all Learners site. You will find links to samples of the Little Books as well as guidance in the use of the program. There are several purchasing options – you may buy a deluxe version of the program, or you may buy each level one at a time. There is also a book to help with program placement and assessment. Wendy and I highly recommend this program. She enjoyed reading time and I enjoyed having all the resources in one place to make my life easier. I also appreciated that the program is easy to implement and you can take it on the go. I plan to use this program with Will this summer. Your child will succeed with this program. For more information, including videos and guidance, please visit the Academic Success for all Learners site. You will find links to samples of the Little Books as well as guidance in the use of the program. There are several purchasing options – you may buy the entire program at once for a discount, or you may buy each level one at a time. There is also a book to help with program placement and assessment.